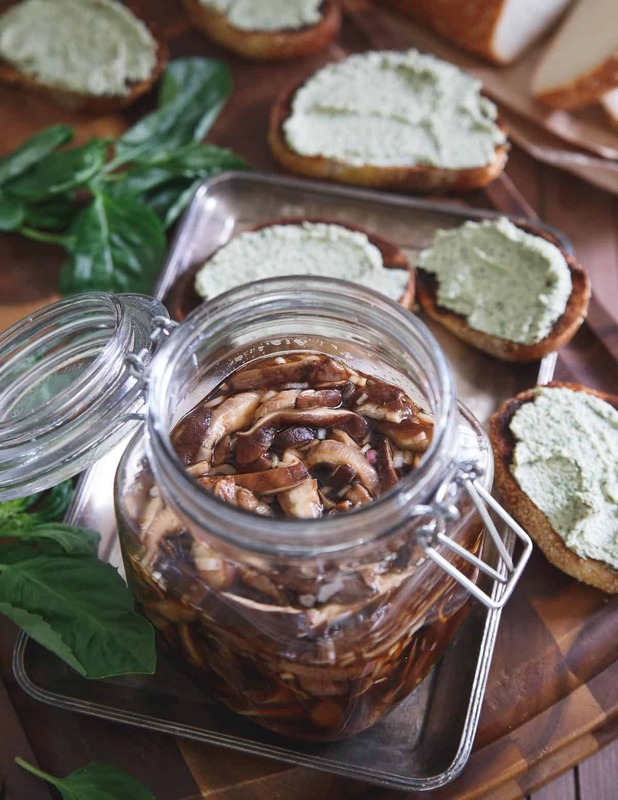 These shiitake crostini have been pickled in balsamic rice vinegar and paired with a creamy basil pesto ricotta spread for the perfect toasty bite. I’ve never understood the mushroom haters. There are definitely things out there weird enough that even my adventurous palate isn’t willing to try or like (um, the ant larvae served with smoked avocado tartare at the Cancun wine and food festival last week would be one of those things) but mushrooms don’t even come close to falling in that category. 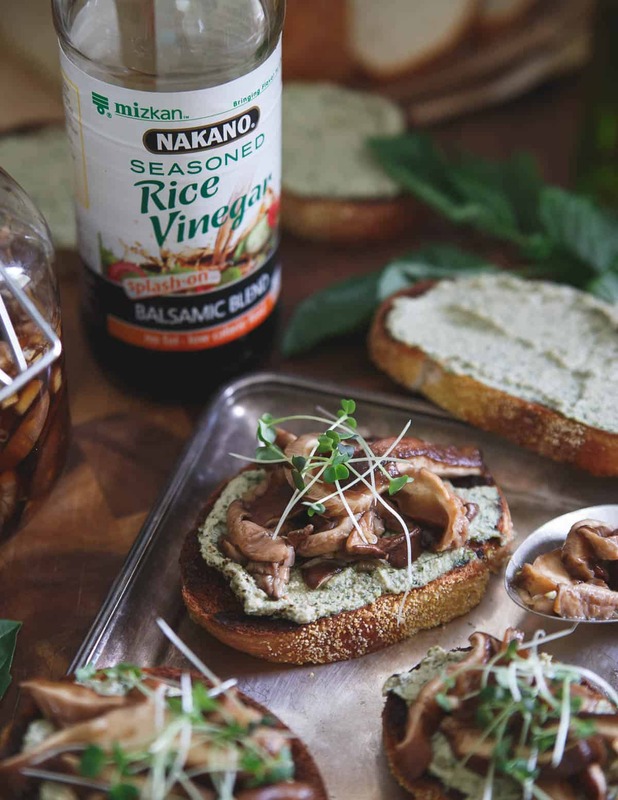 This balsamic pickled shiitake crostini recipe was created in connection with my appointment as a contributor to the Nakano Natural and Seasoned Rice Vinegar. And yet, I feel like the general population is split in half with lovers of all things fungi (me) and extreme haters just like the ever divisive cilantro. I hope you’re a lover. Because these balsamic pickled shiitake mushrooms are baller and worth every penny of their slightly ridiculous price tag ($10.99 a pound, really?!). I don’t even know if that’s an accurate definition but, to me, they epitomize that savory-ness that umami tries to corral in food. When you pickle them in balsamic vinegar, soy sauce and shallots, the whole umami factor just gets explodes exponentially. Nakano’s balsamic blend seasoned rice vinegar brings the perfect tang while the soy sauce highlights a little bit of saltiness in the mushrooms. To offset that deep savory flavor, they’re placed on top of a refreshing basil pesto ricotta spread that will remind you summer is just around the corner (if this miserable NY weather ever lets up). 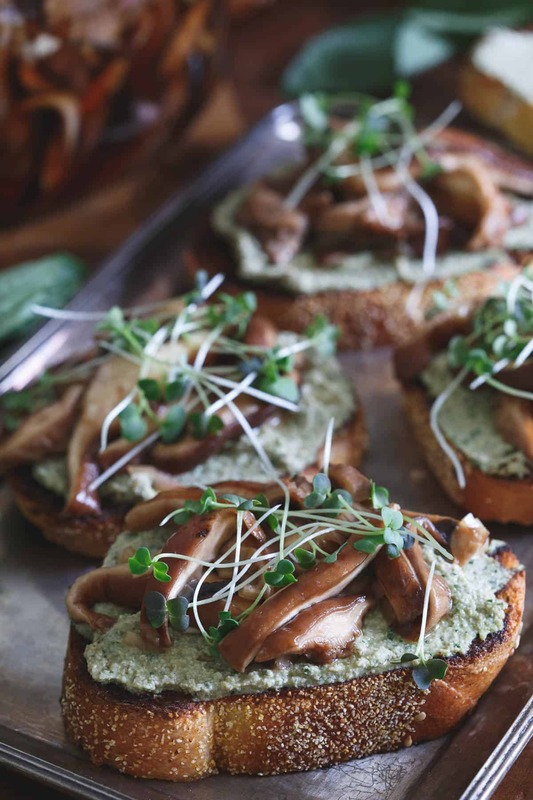 We’ve never done the brunch thing for mom on Mother’s Day so if you’re anything like my family, throw these shiitake crostini on the menu instead. Guarantee it’ll beat French toast any day. Check out more Nakano recipes like these spicy pickled pineapple and this cilantro mango wild rice salad. 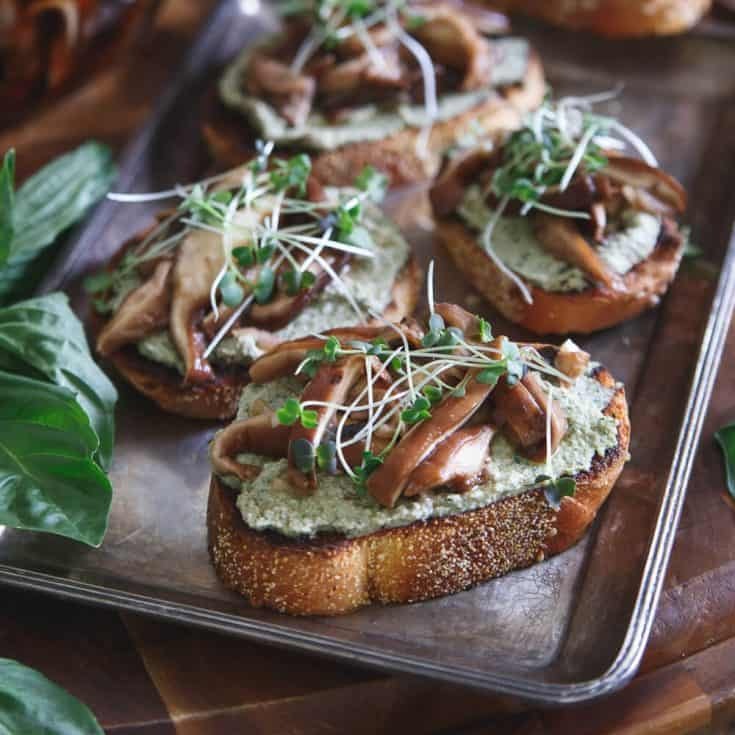 These shiitake crostini have been pickled in balsamic vinegar and paired with a creamy basil pesto ricotta spread for the perfect toasty bite. Make the pickled mushrooms by combining all the ingredients in a medium sauce pot. Bring to a simmer, turn off heat and let cool. Transfer to a jar and keep refrigerated for up to 2 weeks. Make the basil pesto ricotta spread by combining the basil, parmesan, olive oil, garlic, salt and pepper in a food processor. Process until finely chopped. Add the ricotta and process again until incorporated. To assemble, spread the basil pesto ricotta on a slice of toasted bread. Top with a spoonful of the mushrooms and garnish with some microgreens. Serve immediately. I’ve never had pickled mushrooms before, but they sound incredible! I don’t understand mushroom haters either, ant larvae yes (what the hell), mushrooms no. They sound perfect on top of this basil pesto ricotta crostini! Wow, those mushrooms look fabulous! What a creative way to use the vinegar! these crostini look amazing! i haven’t ever used shiitake ontop of croistin before but i have to try it. the photos are incredible. I need these mushrooms in my life! Literally laughed out loud of your explanation of your dilemma with trying to explain “umami” to your husband. Happens to me ALL the time – which is bad since my blog has the word in it. It’s like what do you mean you don’t know!?!? It’s basically – uh uh uhm well MUSHROOMS. Haha. This recipe would be such a perfect thing to bring to my Mother’s Day lunch! I’m a total mushroom LOVER! 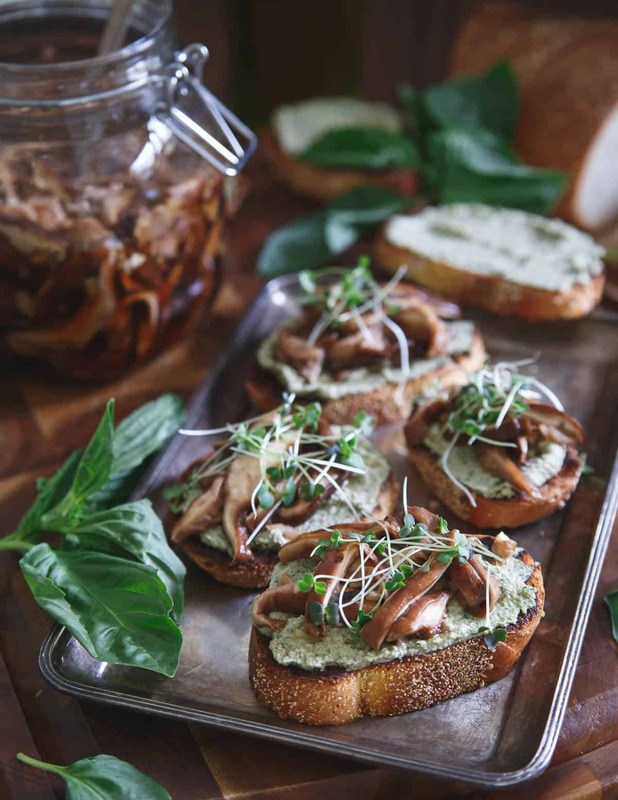 Give me all the fungi :) I love the look of this crostini and I love that it’s such a fun way to use shiitake mushrooms. I want to put these mushrooms on and in everything.. I see some shrimp lettuce wraps soon.. This is so unique!! It sounds absolutely delicious.